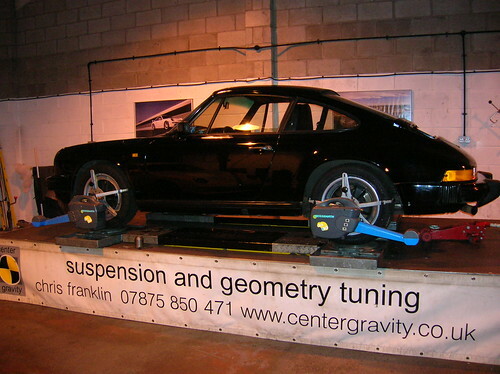 Went to Centre Gravity yesterday for a talk on suspension and car setup. Steve (who organised this year’s Ring and Llandow trips) had taken his fast Supra here earlier in the year. He wasn’t impressed with the handling of this car when he got it, despite the very expensive suspension fitted. Following a day here it went from being “dangerous” to “brilliant”, and having been in the passenger seat on the track, I can say that it handles very nicely. The drive up was a swift 80 mins, and my friend Andy drove my Aero. He seemed to find it ok, said that it picked-up nicely and the ride was ok. In return he drove he without any issues, although was a bit gentle with the thottle pedal and didn’t use enough of the rev range. Was nice being chauffered though. As we arrived numerous other Saab owners turned up, some of whom had come from significant distances to attend the meet. Chris, who runs and does all the work at Centre Gravity, took us into his workshop, provided plentiful tea, coffee and biscuits, and then there was what ended up being a 4 1/2 hour talk/demo/discussion on tyres, suspension and car handling. 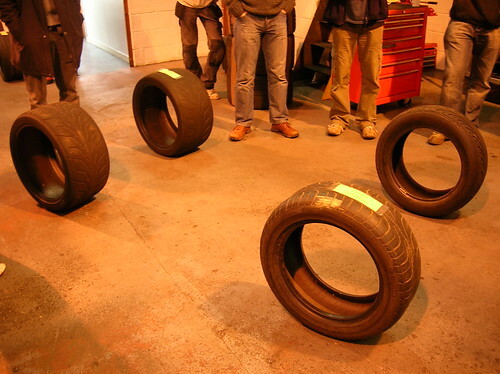 Chris used 4 tyres which had differing wear patterns spaced out at the 4 corners of the car to talk about tyre technology, toe-in, camber, castor, effects of steering, weight transfer, compression, speed effects and just about everything possible, and how they affect the stability, grip, tyre wear and responsiveness of the car. I felt rather geeky that I could easily identify 2 of the three types of tyres from tread pattern (Toyo 888s and Pirelli P6000s are distinctive), and was fairly sure that the others were Potenxza S02s (which they were), although a lot of other tyres have coppied that tread pattern. Following this, he moved onto his wheel alignment rig which is very fancy indeed. 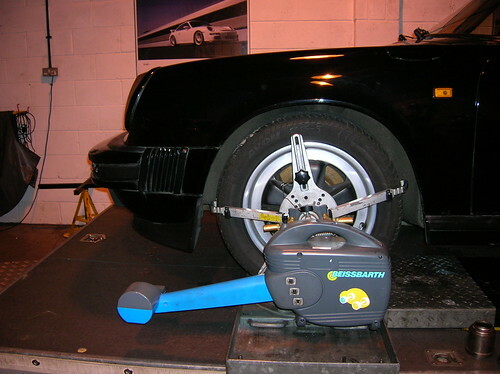 Calibrated weekly, and using the best kit, this allows each wheel to ‘float’ on a ball-bearing supported pad so the car finds its natural position. 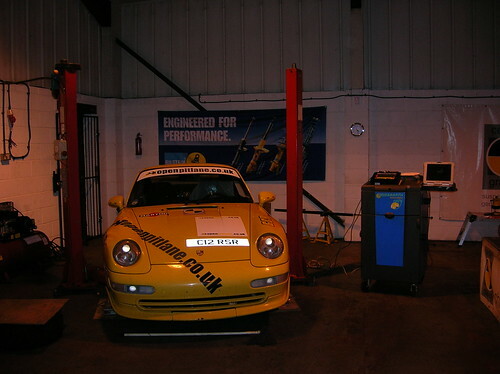 The sensors mount on each wheel and have IR beams between them to measure distances around the car as well as very accurate inclinometers to measure the wheel angles. This information is then all relayed back to a laptop where the setup can be analysed, differences highlighted between corners of the car and allows decisions on what adjustments he needs to make to achieve the desired handling characteristics. Demos were done of how sensitive the kit was, just prodding the wing of the car was enough to register small changes in the geometry readings. 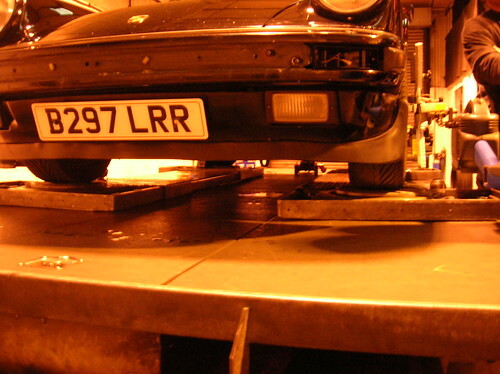 We then had a chap sit in the car to show how the driver’s weight changes things (noticably) – Chris sets cars up with weights distributed in the car to simulate its likely use – e.g. 80kg on drivers seat, I would use weights on the passenger seat too since I normally go out with a passenger on the track. The rear of the car was then jacked-up to move weight to the front to show how that changed the suspension angles. Some of the work seems to involve a knowledge of what the suspension will do under load, so you set the car with that in mind, rather than a setup for a stationary car. 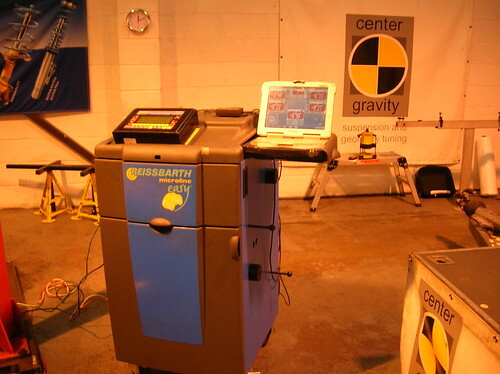 Focus then changed to balancing the weights in a car using weight-measuring pads under each wheel, which are normally placed on the main suspension test rig to ensure the car is on a very level surface, but were used on the floor for this demo. The corner weighting seemed to focus on balancing the weights across the diagonals of a car, comparing it to a table where two legs across a diagonal are longer than the other 2 and it rocks. Small adjustments to individual ride heights can be made, whether through adjustable shims or though adjustable suspension, until the car balances (with the weights inside to represent likely use). This demo was done using thin sheets of ply removed from under the scales to represent ride-height changes. 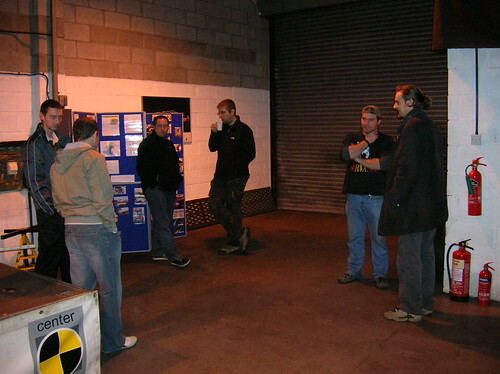 Having been through all the demos some further chatting followed, then more coffee/tea and biscuits, and a short chat with Chris about my Saab’s setup. I need to see what sort of roll angles I am currently getting by analysing some trackday pics, since anything more than 6 degrees is a bit too much. I can see myself coming back here next year if I make the decision to keep tracking the car, and would throughly recommend that anybody who uses their car enthusiastically, and especially if they have made changes to the stock suspension, takes it here for what must be one of the most thorough and accurate setups at a competitive price.